This is the ultimate all-time female soul vocal - or your money back. Comprising 2 LPs (I'm a Loser and A Legend in her Own Time) on one CD plus 3 additional tracks from her days as Doris Willingham. The original I'm a Loser on the Canyon label was recorded in 1969, and is a must have record for anyone in the know, as selected by Dave Godin, the foremost expert journalist in deep soul, who rated it as the best LP he had ever heard. In 1973 Doris visited the UK, which was when I had the good fortune to be assigned to take a photo session, which includes the cover shot. You may own this exceptional disc, produced by Jerry Williams Jr (Swamp Dogg), and featuring the finest instrumental backing that Muscle Shoals has to offer including a rhythm section with Duane Allman. 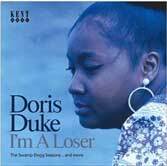 Paradoxically you will be the loser, only if you do not own this CD. We also can supply a limited 20 x 16 fibre monochrome photograph from the same session. Please ask for details.